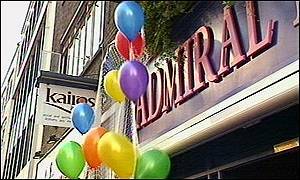 On the 30th April 1999 David Copeland planted the third of three bombs in the Admiral Duncan bar on Old Compton St. 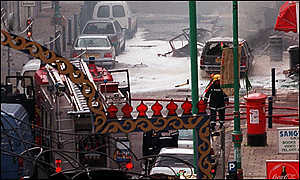 The bomb exploded at 6.37pm killing three people (Nik Moore, Andrea Dykes and John Light) and injured many more. This archive has been set up to collate and record information about the attack and what has happened since. 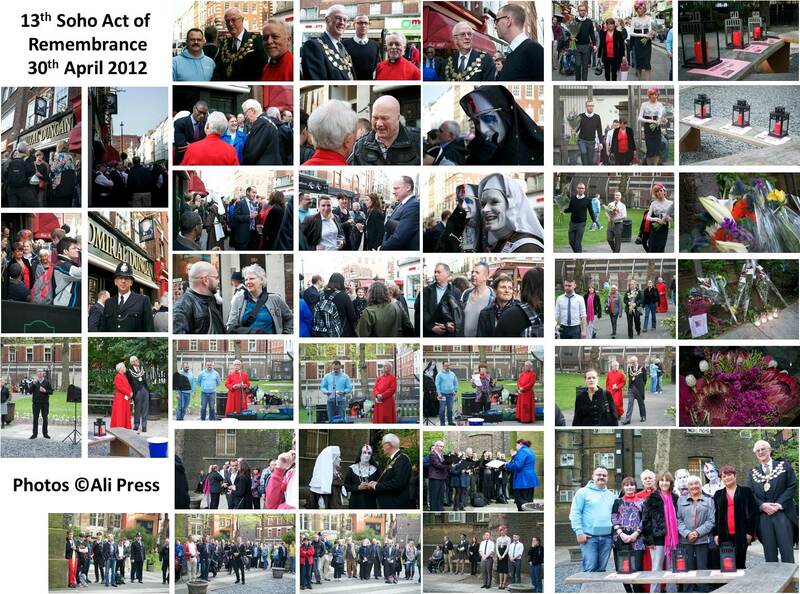 Each year, on the anniversary of the attack – people gather for an Act of Remembrance in St Anne’s Gardens. To remember those who lost their lives, those who survived along with those affected by these attacks who need our on-going support, bringing our communities together to raise awareness and tackle hate crime to prevent these events happening again. Everyone is welcome to come along and take part in the short service. 20th February 2018: Meeting between Rev Simon Buckley, Karl Nixon (new manager at The Admiral Duncan) and Mark Healey held at St Anne’s Church to organise the 19th anniversary act of remembrance. 30th April 2018: Metro Deadly nail bomb attack at Admiral Duncan in Soho remembered 18 years on reported by Charles White. On the 12th June 49 people were shot and killed in Pulse Night Club, Orlando. Within 24 hours 17-24-30 helped organise the Soho Vigil for Orlando. 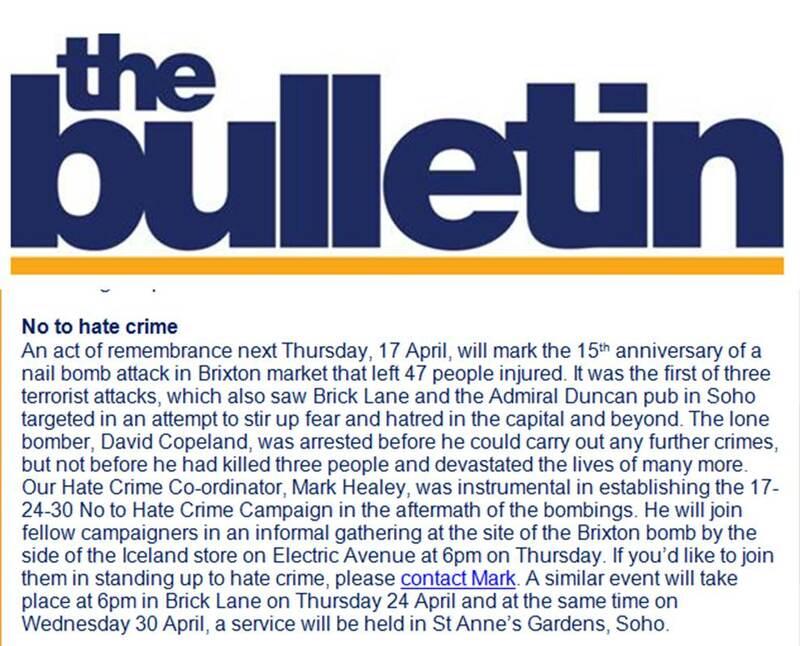 29th April 2014 – 17-24-30 No to Hate Crime Campaign used it’s Twitter #HateCrimeVigil profile on the eve of the 15th anniversary to tweet about the Act of Remembrance in Soho. 11th April 2014, The Bulletin, Lambeth Council’s internal staff newsletter included notice of this year’s arrangements – including mention of the service taking part in Soho. It has been confirmed that representatives from all three Mayor’s Offices (Lambeth, Tower Hamlets and Westminster) will be attending this year. In the lead up to the 15th anniversary of the Soho Nail Bomb attack Mark Healey had meetings with Rev Simon Buckley (St Anne’s Church) and Martin Prendergast (Westminster & Soho LGBT Community Forum). Liaison continues with some of the survivors from the Admiral Duncan and members of the Moore family. Invitations sent out to the three Mayors and Borough Commanders representing Lambeth, Tower Hamlets and Westminster councils. 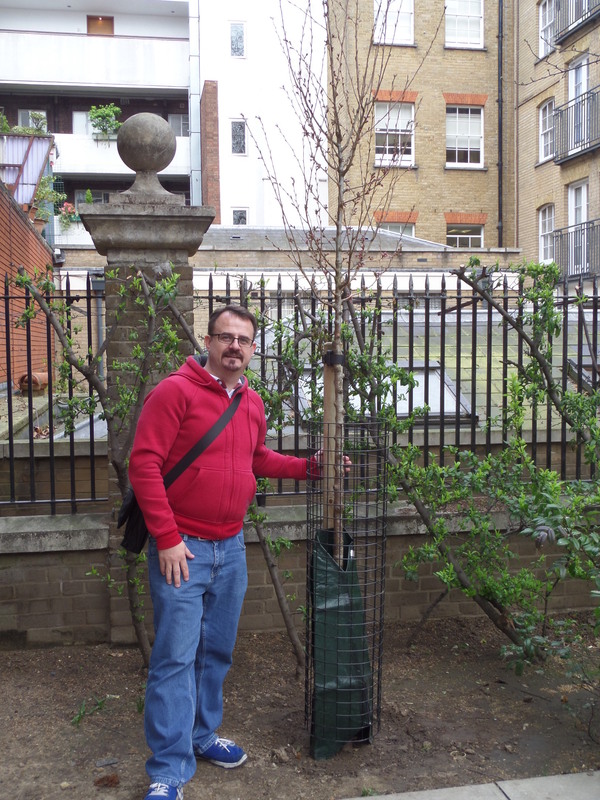 Mark Healey standing by the new memorial tree replanted in St Anne’s Garden. One of the three original memorial trees planted in St Anne’s Gardens had stopped growing, in liaison with 17-24-30 No To Hate Crime Campaign Cllr Jonathan Glanz arranged for a new tree to be planted to replace it. 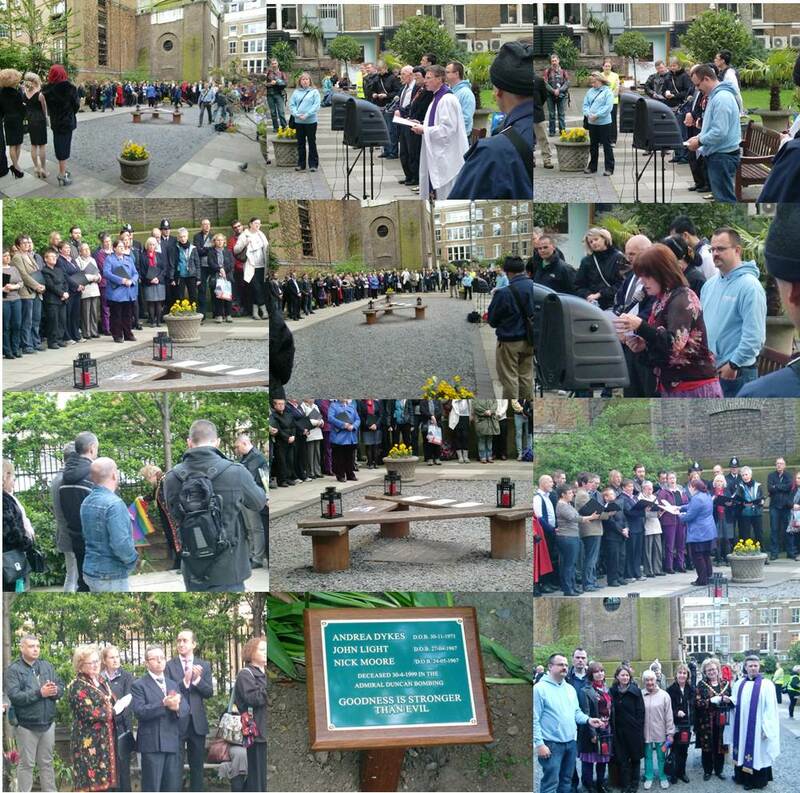 Tuesday 30th April 2013 – a beautiful service took place in St Anne’s Churchyard to mark the 14th anniversary and was very well attended this year. Service lead by Rev Simon Buckley (St Anne’s Church) and Mark Healey (17-24-30 No to Hate Crime Campaign), with a poem read by the Moore family and a song sung by Diversity Choir. The replacement plaque was covered with a rainbow flag donated by Prowler Soho. The Lord Mayor of Westminster unveiled the new plaque and gave the rainbow flag to members of the Moore family. After the service in St Anne’s Gardens some of those present returned to the Admiral Duncan. Drag Artist Mrs Moore (not related to the Moore Family) hosted the rest of the evening. In the lead up to the 14th anniversary it became apparent that the original memorial plaque had gone missing. 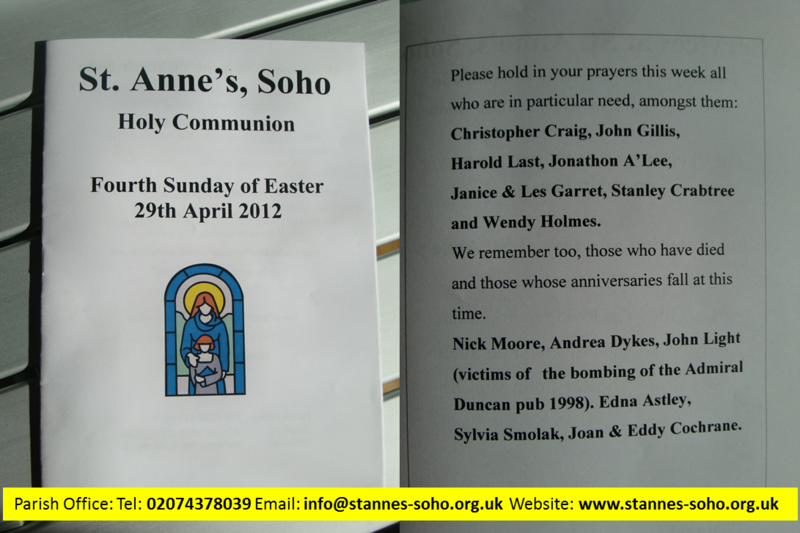 Monday 30th April 2012 – Service held in St Anne’s Churchyard to mark the 13th Anniversary. Arrangements for the act of remembrance were confirmed with Fr Ronald Swan from St Anne’s Church and Craig Taylor the General Manager of The Admiral Duncan and Duke of Wellington. 6pm Friends and family will gather at The Admiral Duncan. 6.20pm People will walk round to St Annes’s Gardens. 6.30pm Short service lead by Fr Ronald Swan from St Annes’s Church. Followed by Readings by the family and Sisters of Perpetural Indulgence TBC. Gardens will remain open until 8pm to allow people time to pay their respects. Click here for link to photos taken by Ryan Parkins. Click here for link to St Anne’s website. Butchfemmeukrainbow (27 April 2012) – 13th anniversary of Admiral Duncan Bombing. West End Extra (27 April 2012) by Mark Healey – Admrial Duncan 13 years on. 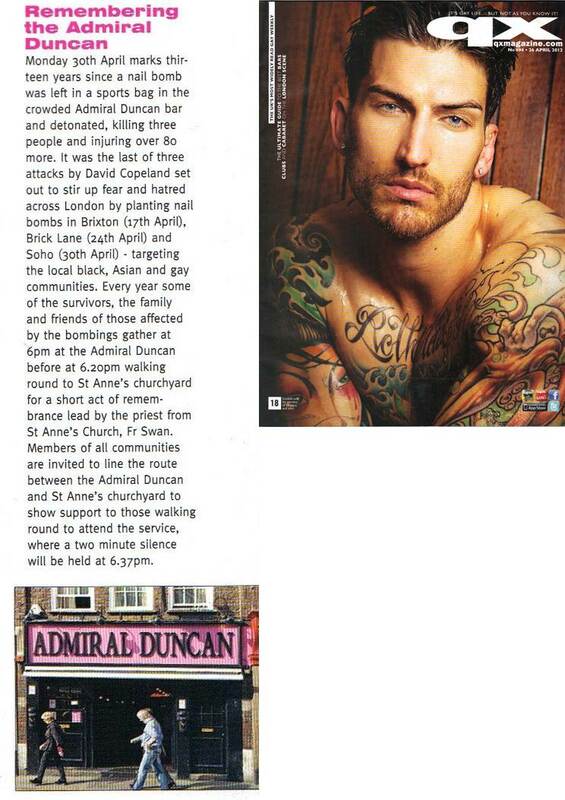 QX Magazine (26 April 2012) – Remembering the Admiral Duncan. LGBT History Project (23 April 2012) – The Bombing of the Admiral Duncan. 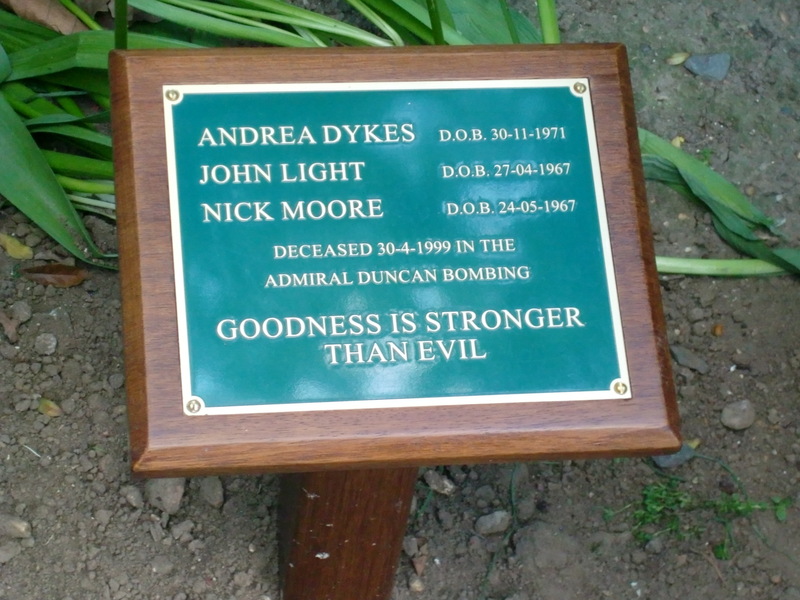 Out in the City (23 April 2012) – Admiral Duncan Attack Remembered. Independent Catholic News (23 April 2012) – Service for anniversary of Admiral Ducan bomb. GayStarNews (23 April 2012) by Alex Hopkin – Anniversary of the London gay bomb attack. 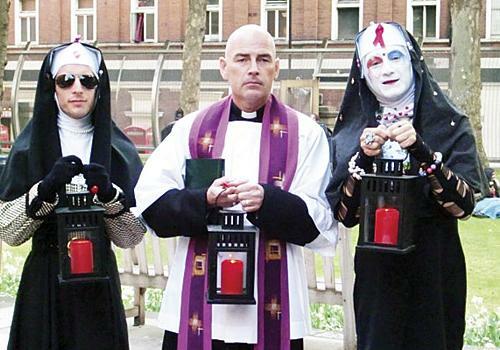 West End Extra (02 March 2012) by Laura Macphee – LGBT Catholics plan Soho Mass anniversary. West End Extra (8 July 2011) by David St George – Soho pub bomber denied cut to sentence. Pink Paper (3 July 2011) by Jonny Payne – Gay bar bomber fails in attempt to have sentence reduced. 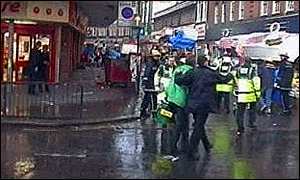 Lancasterunity (2 July 2011) by Antifacist – Soho bomber David Copeland loses appeal over sentence. Pink News (1 July 2011) by Jessica Green – Soho bomber David Copeland loses appeal over sentence. Gay Activist (3 June 2011) – The Admiral Duncan. West End Extra (6th May 2011) by Tom Foot – Article. WordPress (1 May 2011) by Mark Healey – Why it is important to remember Soho? 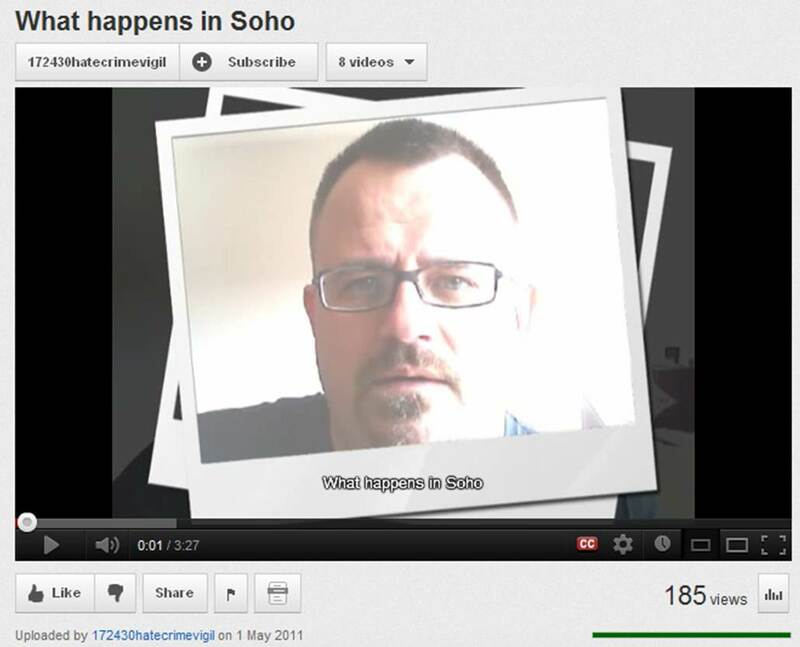 What happens in Soho – YouTube video. Networked blogs (30 April 2011) by AJ Allen – Anniversary of Admiral Duncan Bombing. Pink News (29 April 2011) by Henrietta Ronson – Remembering the Admiral Duncan bombing 12 years on. 21 March 2011 – 17-24-30 launch this WordPress site to mark the 12th anniversary of the London Nail Bomb attacks on Brixton, Brick Lane and Soho. Click here for Part one, Part two, Part three and Part four. Pink Paper (26 Oct 2010) by Charlotte Reid – 3,000 people attend London hate-crime vigil. Pink News (9 Feb 2010) by Adam Lake – Interview: Why I believe in an international day against hate crime. Pink Paper (18 Jan 2010) by Adam Lowe – BNP member jailed for 11 years after nail bomb find. Pink News (15 July 2009) by Jessica Green – Neo-nazi obsessed with homophobic bomber could face years behind bars. Theatre: Proud by John Stanley, a gay themed play marking the 10th anniversary of the Admiral Ducan bombing. Theatre: First Domino by Jonathon Cash – a fictional English play about the London nail bomber (Jonathan was injured during the bombing of the Admiral Duncan). 30th April 2009 – 10th anniversary gathering took place in St Anne’s churchyard. Flowers placed under the three cherry trees in St Anne’s churchyard. 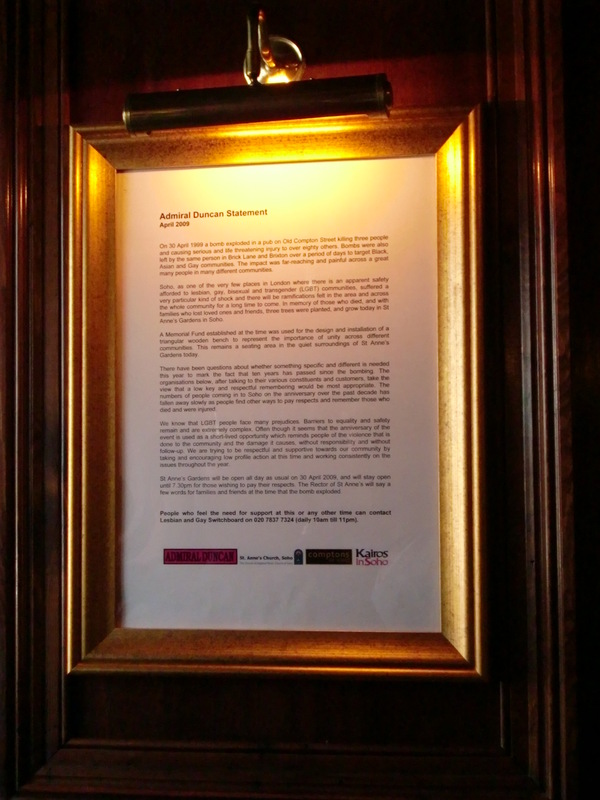 Notices that went up in some the bars, including the Admiral Duncan, Duke of Wellington and Comptons. Pink News (30 April 2009) By Jonathan Cash – Admiral Duncan bombing: The day that my life changed forever. Pink Paper (30 April 2009) by Martina Booth – Silence to remember bomb victims. 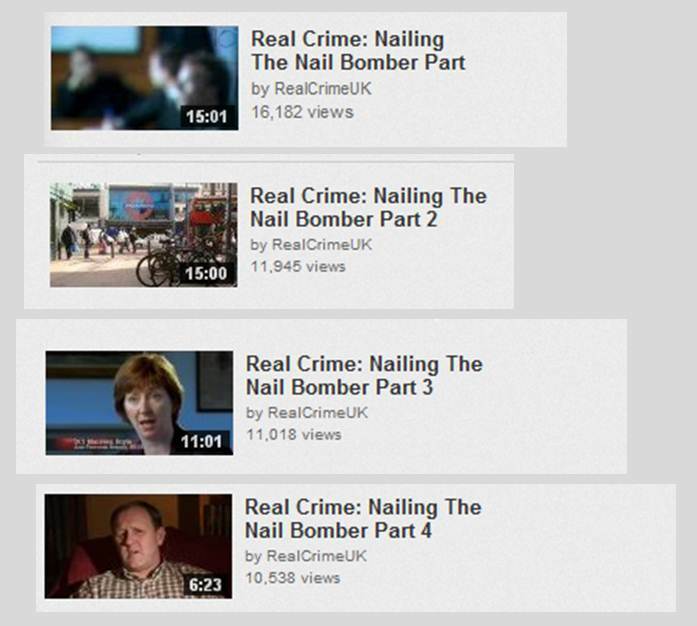 3rd April 2009 – Mark Healey set up 17-24-30 Facebook group to mark the 10th anniversary of the London Nail Bpmb attacks on Brixton, Brick Lane and Soho. You can find 17-24-30 on Facebook by clicking here. Pink News (31 Dec 2008) by Rachel Charman – Gay charity boss Ben Summerskill to receive OBE in New Years Honours list. Digital Spy (17 April 2008) by Reiver97 – 9th anniversary of White English Terrorist bombings in London. Pink News (23 July 2007) by Tony Grew – Home Secretary may consider gay hate crime law. Pink News (29 June 2007) by Tony Grew – Pride should go ahead as planned say police. Pink News (29 June 2007) by Tony Grew – Bomb on Pride route contained nails. Pink News (17 April 2007) by Tony Grew – Gay activists focus on stopping the BNP. Pink News (2 March 2007) by Tony Grew – Soho bomber to stay in prison for 50 years. The Telegraph (2 March 2007) by Richard Holt – Soho nail bomber to serve at least 50 years. Pink News (9 Nov 2006) By Marc Shoffman – Tourism minister shamed over Jerusalem Gay Pride. Pink News (16 Dec 2005) by Staff Writer – Police express disappointment at lack of convictions for gay barmans killers. Pink News (14 Dec 2005) by Benjamin Cohen – Teen gang convicted of manslaughter of gay barman. Pink News (25 Nov 2005) by Benjamin Cohen – “Happy Slapping” girl asked gay murder victim to “pose for the camera”, court told. Pink News (9 Nov 2005) by Benjamin Cohen – Girl filmed gay barman being kicked to death on her mobile phone. Pink News (4 Nov 2005) by Benjamin Cohen – Racist and anti-gay magazine publishers given jail sentences. BBC NEWS (Tue 1 Nov 2005) – Soho Bomb survivors await pay-outs. theguardian (2 Nov 2004) by Sandra Laville & Rosie Cowan – Gay Murder victim survived Soho bomb. 30th October 2004 – David Morley (Sinders) who survive the Soho bombing, is attacked by a teenage gang on the Southbank, and dies of the injuries he sustained. This is london (14 October 2003) – Soho bomb memorial unveiled. 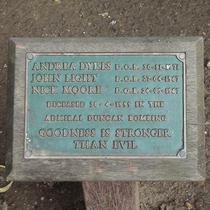 Memorial Bench designed by Simon Kidd unveiled in St Anne’s churchyard by Ken Livingstone, Mayor of London. TheTelegraph (1st July 2000) by Sally Pook – “It was the loudest and most alien sound I’d ever heard”. BBC News (Fri 30 June 2000) – The Soho bomb victims. TheGuardian (Fri 25 Feb 2000) by Nick Hopkins – Bomber admits Soho Killings. British Journal of Anaesthesia (1 Feb 2000) – Experience of a major alert at two hospitals: “The Soho Bomb”. Peter Tatchell (Oct 1999) – After the bombshell. The Independent (Sat 24 July 1999) – No payout for gay Soho bomb victim cash. Guardian (4 July 1999) by Martin Bright – Soho bomb survivor commemorates dead as “queer nation” marches on. BBC NEWS (Tue 29 June 1999) – Soho bomb pub to reopen. 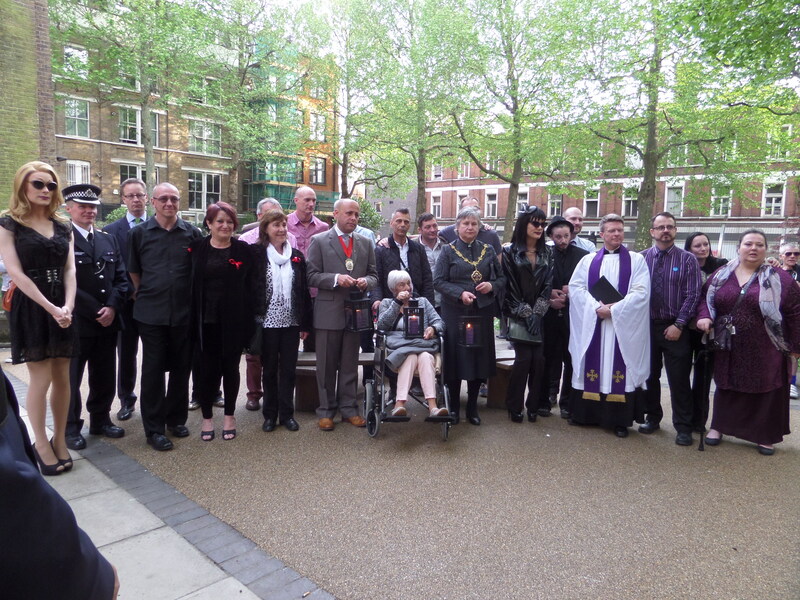 Friday 7th May 1999 – April Bombings Vigil of Remembrance took place outside the Admiral Duncan, followed by an “Act of Prayer and Reflection” in the gardens of St Anne’s Church Soho. Speakers include Peter Tatchell, and pictured above Ken Livingstone MP, Darryl Telles Lesbian & Gay Coalition against Racism, Tess Joseph Jewish Gay & Lesbian Group, Stephen Kristian Outrage!, Teresa Bennett Anti-Nazi League, Tom Robinson singing “Glad to be Gay”(with updated lyrics), Sue Sanders Schools Out and Sukwant Dhaliwal Southall Black Sisters. World Socialist Web Site (Fri 4 May 1999) by the Editorial Board – London nail-bomber arrested – what shapes the psychology of hate? The Independent (Sat 1 May 1999) – Kathy Marks & Andrew Buncombe – Soho Bombing: ‘People tumbled over each other in a panic to get out’. TheGuardian (Sat 1 May 1999) – Nail Bomber strikes in Soho. 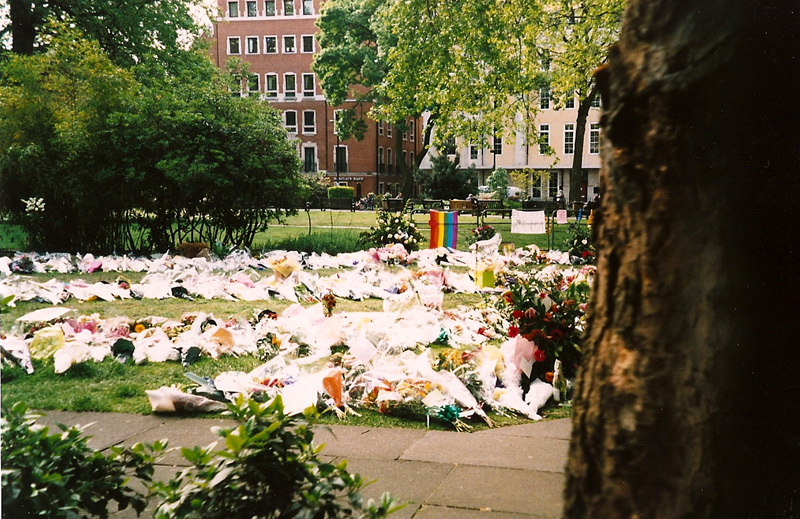 Tuesday 4nd May 1999 – Soho Square, after the bomb on Old Compton Street. Flowers placed outside The Admiral Duncan were moved to Soho Square. 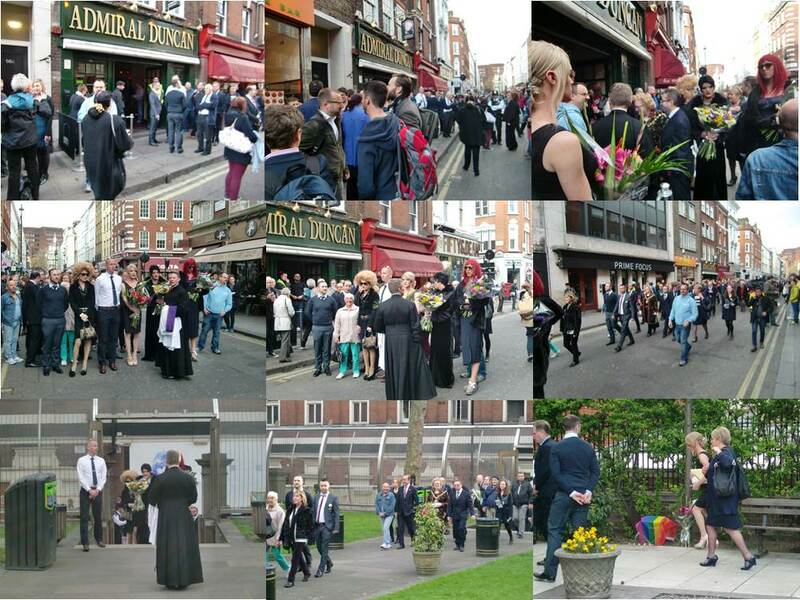 Tuesday 4th May, the members of the London Gay Men’s Chorus gathered up the bouquets of flowers and massages outside the Admiral Duncan, and in a procession watched by people lining the streets, walked them several hundred years to Soho Square. 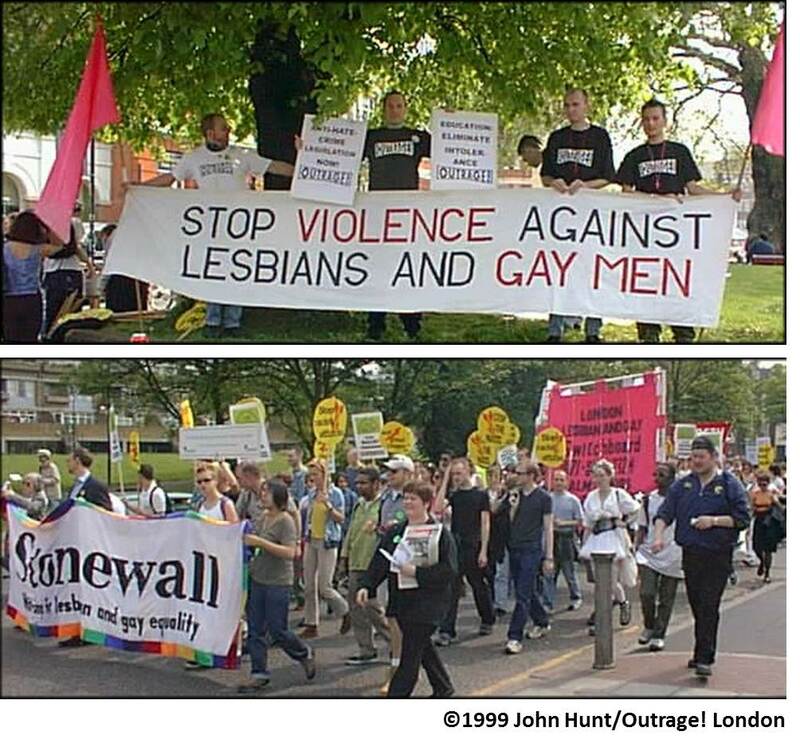 Saturday 1st May 1999 (OUTRAGE) Lambeth UNISON, backed by the Anti-Nazi League, the National Assembly Against Racism, The National Black Alliancem and the Movement for Justice joined a number of Lesbian, Gay, Bisexual and Trans Community groups including Outrage!, Stonewall and the London Lesbian & Gay Switchboard. Lesbian & Gay Christian Movement (1 May 1999) – Gay pub bombers condemned. Three people killed – Andrea Dykes, Nick Moore and John Light. Ken Murphy, a motorcycle paramedic with London Ambulance Service first on the scene. 21 Ambulances were called, to take the injured to University College, Guy’s and St Thomas’s Hospitals. Over 80 people injured, 13 seriously injured – inlcuding two who had lost limbs – and 68 with minor injuries. Scotland Yard’s Deputy Assistant Commisoner Alan Fry appeals for information and public to remain vigilant. Lesbian and Gay Police Association available in Police Mobile Command vehicle located in Soho Square. BBC NEWS (Fri 30th April 1999) – Soho pub bomb in pictures. 39 people injured in Brixton Market, including two children and a police office. A 23 month old boy has a 2 cm nail removed from his brain by surgeons at Great Ormond Street Hospital.